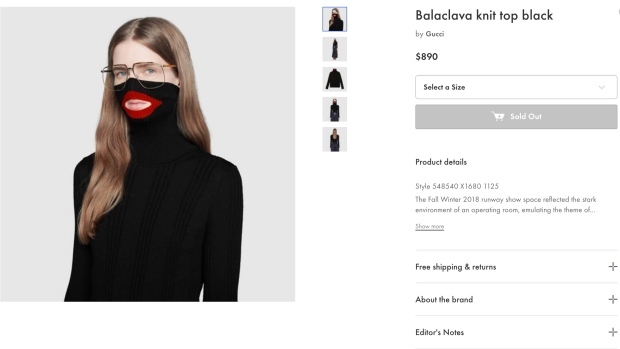 Kering SA’s Gucci withdrew a sweater resembling blackface images like those currently roiling U.S. politics, becoming the latest fashion brand to get embroiled in a controversy over perceptions of racism. The Italian luxury label apologized for selling the US$890 black turtleneck, whose extra-high collar features a pair of exaggerated red lips around an opening for the wearer’s mouth. Gucci said it removed the item from its online and physical stores. The brand’s misstep comes as Virginia Governor Ralph Northam resists calls to resign after the revelation of a photo from his 1984 medical school yearbook page, showing one individual dressed in a Ku Klux Klan robe alongside another in blackface. He has also apologized for darkening his skin to dress up like Michael Jackson for a dance contest in that same year. John Yorke, president of Rain43, discusses the social-media backlash against ads from two luxury fashion brands. Dolce & Gabbana's "chopsticks" ad was widely panned in China, while Dior's ad starring Jennifer Lawrence was accused of cultural appropriation. Gucci has made diversity and progressive values central to the hip reboot that has sparked rapid growth for the brand since designer Alessandro Michele took over in 2015. The brand banned fur from its collections, saying the material was “not modern,” donated to a gun-control march and released an ad campaign with only black models that was inspired by the late 1960s soul music scene.